The winner, Quantifeel wireless sensor technology, quantifies the forces experienced by containers on packaging lines. The “line map” technology takes this innovation to the next level by giving a visual, bird’s eye view of the magnitude and line position of forces that containers are experiencing. Manufacturers are able to see a picture of where they have problem areas and take corrective action at the root cause to correct issues such as breakage, denting, scuffing, leakage on their lines. The sensor unit travels through the seamer unobstructed and without interfering with normal operations. An outstanding finalist in the category, Hanovia’s Pureline S, UV Disinfection System for water, brine or syrup utilises powerful, low-wavelength ultraviolet light to destroy bacteria and other microorganisms without the use of chemicals and can be used as a substitute for pasteurisation. It has a smaller footprint than pasteurisers and uses less power giving the customer energy cost savings. Mazza Innovatio’s PhytoClean pressurised water extraction process is an advanced method for bioactive extraction that yields clean ingredients in an environmentally-responsible way, applying heat and pressure to water to lower its polarity, causing it to behave like an organic solvent. Merck KGaA – ReadyPlate 55 offers a convenient solution to the standard microbial test performed by beverage and drinking water industry, which due to the high throughput of samples, can be problematic for companies in terms of storage space, reproducibility and reliability of results. The winner was Coravin’s new concept, Wine Freedom by the Glass, which allows wine enthusiasts to enjoy wine sealed with corks without feeling the need to commit to the whole bottle. 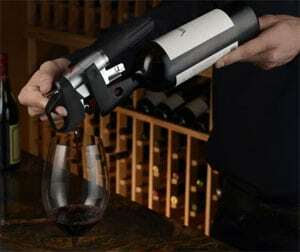 With Coravin, wine, after being accessed, remains in the bottle, continuing to evolve naturally as it was never exposed to oxygen. Also regarded for its smart technology related to alcohol consumption, AMV BBDO’s Martini Smart Cube uses capacitive liquid sensors in the ice cubes to detect the liquid levels in the glass and sense when the drink is finished. The cube then alerts the bartender using Bluetooth technology and an iPad, allowing them to prepare the drink in advance. Water.IO Smart Cap is a beautifully simple but important application that helps users stay hydrated. The smart cap fits to any standard water bottle. It is reusable and can be transferred from one bottle to another (pictured top). Beyond water, the company offers IoT smart-caps solutions for the pharma, beauty, cleaning and additional industries. Today, Water.io is able to transform any bottle into a smart bottle – no matter if contains a liquid, powder, pill, or capsule. Kancor Ingredients was the winner of the with OxiKan, a range of natural antioxidants extracted from rosemary to tackle oxidation in food and beverages as a substitute for synthetic antioxidants, which are widely used to control oxidation in food and beverages. OxiKan CLS is a completely refined, fully deodorized and decolorized rosemary extract with highly functional anti-oxidant molecules and doesn’t impart any flavour, aroma or colour to the final application, making it an ideal product for beverage formulators. Kino Biotech’s Kinohimitsu Sky Grass impressed the judges as a beverage ingredient solution made of 100% pure wheat grass, an alkaline food which helps purify blood, eliminate toxins and effectively alkalise acidity. The uniqueness of the Kinohimitsu Sky Grass lies in where the wheat grass grown – indoor organic aeroponic cultivation enables the plant to be grown in the air (not in soil or water) which enables the plant’s roots to be preserved and kept edibile, as 70% of the nutrients are contained in the roots. The wheat grass is then harvested on the eighth day, when it has the highest nutritional values, and is freeze-dried to preserve its optimum condition.